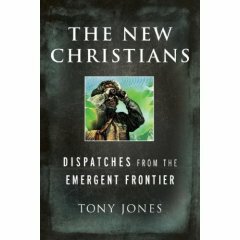 The New Christians: Dispatches from the Emergent Frontier by Tony Jones is a new book that gets released this week to an eager audience. Tony is the National Coordinator for Emergent Village in USA and has been a friend for a decade. I found his book to be a meatier step forward from his earlier Postmodern Youth Ministry and an enjoyable trip through many events that I participated in over the years. To read the book is to understand where Tony is coming from, that middle ground between fundamentalism and liberalism that Lesslie Newbigin pointed to in his classic book Proper Confidence. It is also to get a feel for Tony himself and to a large extent, the flavor of Emergent Village and their many conversations and conferences. And for those reasons, I really like the book and recommend it. Tony and I were at the same seminary although our paths didn’t cross until 1998, when we both ended up in a small group called Young Leaders. But in the early nineties, Tony studied theology at Fuller Theological Seminary and I studied missiology at Fuller School of World Mission. Thus we approach the emerging church movement from different starting points. For Tony, the “emergent movement is robustly theological” (Dispatch number 9) and his book highlights the theological struggles towards a “whole Bible”, a dynamic understanding of the gospel, the embrace of paradox, and the limits of human ability to express “truth”. All of which is good and relevant and part of the conversation that carries these Emergent Village events. But the missiological underpinnings of this movement, so intrinsic in my opinion to truly understanding the motivation and rationale of what we are now seeing on a global scale, are not adequately addressed in The New Christians. This is not a criticism of the book, just an acknowledgement that many of us have arrived at this movement from different streams of thought and practice and, in fact, the banter we enjoy from different perspectives is helpful and often exhilarating. Missiologists and theologians need to dance together. My major problem with the book regards the ridiculous claims written on the cover. Tony told me in an email that these were not written by him but rather the promoters of the book. I am hoping this early copy of the book will be the end of such silly talk. To say Emergent Village is “the” nonprofit organization of the Emergent movement is to throw chai latte in the face of other organizations inside the Emergent Movement, some of them older and larger than Emergent Village. But I am assuming the book released this week has a cover blurb that is more consistent with reality and I probably don’t need to bring it up. But just in case it slips by, it should be said that “emergent” is a word that has been applied to new church planting for a very long time. It was used in the past to describe the early church in the book of Acts but also used in the 20th Century to describe the new churches rising up in cross-cultural mission contexts. The Roman Catholics often used the phrase “emergent church” with a missiological bias and it is common to read of “emergent church” in India (1970’s) or to refer to the 1981 book written by the Catholic German Johann Baptist Metz called “The Emergent Church”. To say that an American group of protestants have hijacked the word “emergent” and are now the official spokesmen for its usage shows a dismal understanding of mission history. Anyway, enough ranting about American ecclesiastic colonialism, The New Christians its a good and enjoyable book. Its not as eloquent nor as grand as Brian McLaren in Everything Must Change but its more gritty and personable and locked on to the expected grids of contemporary theological thinking, yet at the same time avoiding polarities and divisive categories. Shoot . . that was a really long sentence . .
And it is not as deliciously subtle as Pete Rollins in How (Not) To Speak of God but it is more approachable and explanatory. Tony often pauses to define the words he is using for those who need an onramp to the conversation. In fact, that is what the book is to me: an onramp for those who want to join the conversation, and a scrapbook of thoughts and memories for those who have been coming along for the ride. cool. thanks jason. Tell the porsche dealership to deliver my prize directly to my driveway. WHAT – Andrew you’re not going to get a hybrid? For shame, for shame. Several of us from around the blogsphere are reading “Everything Must Change” together and discussing our thoughts. We’ve just begun, but we’ve set it up in a way where it’s never to late to participate.